The year end holidays present a perfect opportunity to entertain ourselves with games and puzzles. One of my favorite games is Clue: The Classic Detective Game. The object of the game is to solve a murder mystery by finding clues about the identity of the murderer, where the crime took place, and which weapon was used. Each player assumes the role of one of the six suspects, and attempts to deduce the correct answer by strategically moving around a game board representing the rooms of a mansion and collecting clues about the circumstances of the murder from the other players. When you have collected sufficient clues you can announce that it was Professor Plum, in the Hall, with the revolver! Genealogists are detectives that collect clues from historic documents. Many of those clues will lead to other documents that help us to deduce the facts about our ancestors. Who were they? How did they arm themselves to make a living? Where did they live, work and socialize? The clues to answer these questions are found in genealogical and historical documents. Names, occupations, dates and places are clues that help us identify the most likely suspects of our family history. Some people get excited about receiving holiday cards in the mail. I get excited when I receive an envelope with a vital record for an ancestor. On December 15, I mailed a check for $5.00 to the State of Louisiana, Secretary of State for the Death Certificate of Price Bishop 1890-1955. On December 17 a staff researcher at the Vital Record office found the death certificate and put it in the mail to me on the same day. I was really excited about how quick and inexpensive it was to order a death certificate from Louisiana. The death certificate for Price Bishop contained some amazing clues about his identity and his last days in New Orleans. These clues lead me to other documents and images which help to illustrate his life. 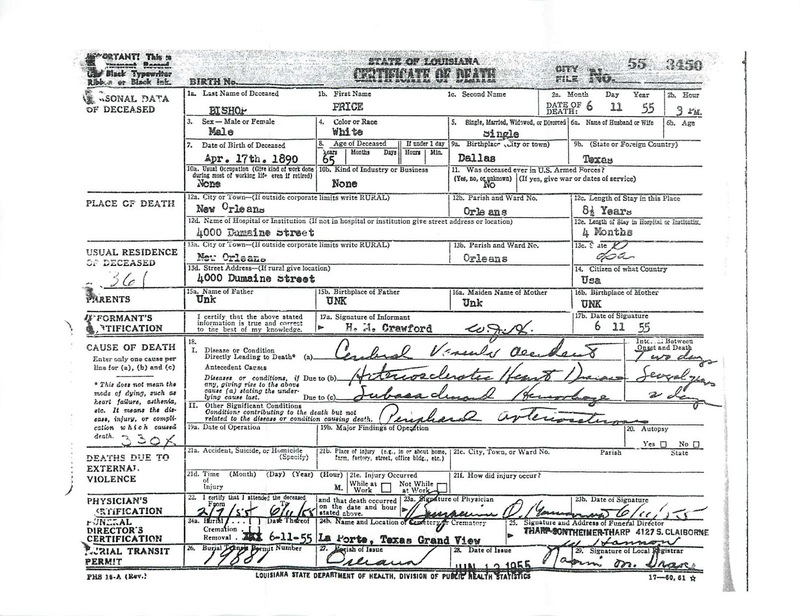 Let's use this death certificate as an example of how to analyze clues in historic documents. 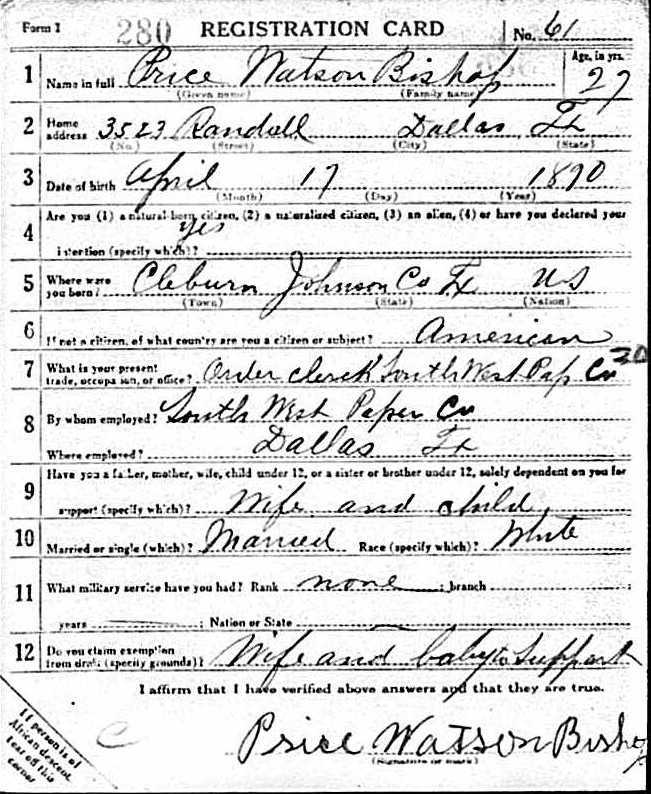 Box 7 on the death certificate contains the date of birth of the deceased: April 17, 1890. This date matched the date of birth that I had from his World War I draft card so I knew I had the right man. 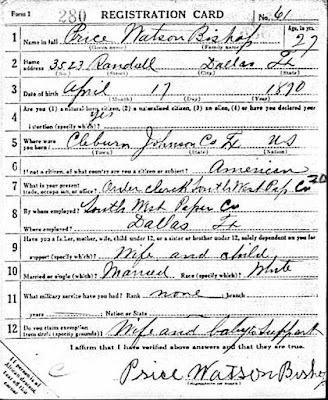 World War I Draft Card of Price Watson Bishop born April 17, 1890 in Cleburne, Johnson County, Texas. However there is a slight discrepancy between the two documents. 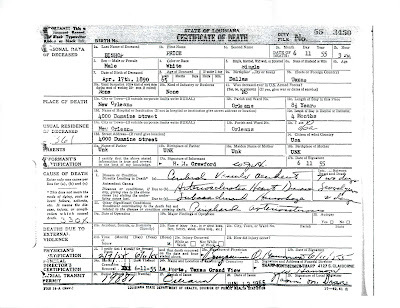 The death certificate states that Mr. Bishop was born in Dallas, Texas. The draft card states that he was born in Cleburne, Texas. These two cities are only sixty miles apart. Mr. Bishop was residing in Dallas in 1918. Usually the draft card would be considered a more reliable source since the information is a first hand account from the man himself. The informant on the death certificate would be considered a secondary source relying on his memory in a stressful time after the death of a friend or loved one or perhaps the informant knew very little about the person. To further emphasize this point, the informant did not know the names and places of birth of the parents of Mr. Bishop. Price Bishop was residing for four months prior to his death at a hospital or institution at 4000 Dumaine Street in New Orleans. The physician attended Price Bishop from 7 February 1955 to the date of his death which is a four month period. You can discover a lot more than your ancestor's name and address in city directories. The clue from the death certificate was that there was a hospital or an institution located at 4000 Dumaine Street in New Orleans. Instead of using a general search, it is best to search directly within the City Directory database. The image below shows the City Directory search page which can be accessed from the card catalog at Ancestry.com. Access the City Directory search page from the card catalog at Ancestry.com to conduct a keyword search. I used the address "4000 Dumaine" as a keyword search and limited it to the year 1954 which was one year before the death occurred. Several names came up as matches for this address. 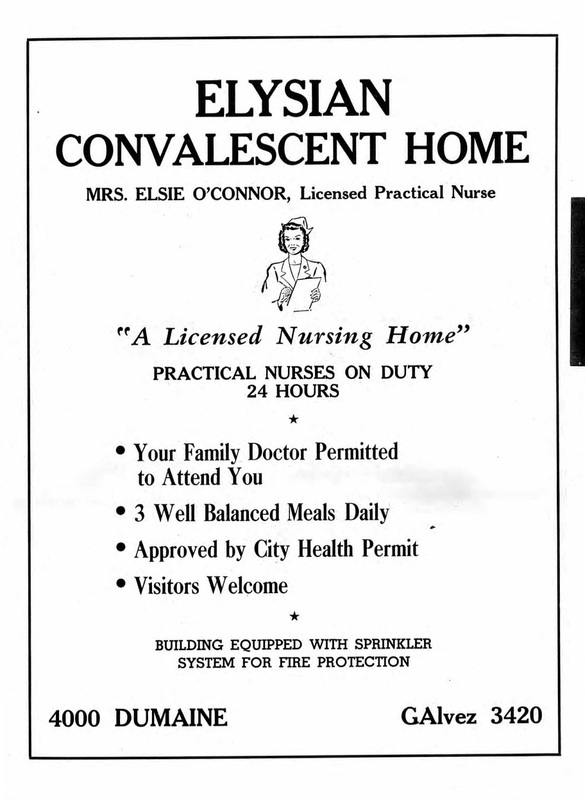 Advertisement in the 1954 New Orleans City Directory for the Elysian Convalescent Home at 4000 Dumaine Street. 4000 Dumaine was located very close to the New Orleans City Park. This building was certainly large enough to serve as a ten-bed nursing home in 1955. Unfortunately, the cemetery has been unable to find his burial record to determine the location of his burial. Apparently, this cemetery files their burial records under the name of the owner of the cemetery lots. We tried looking under all of the names associated with the four daughters of Price Bishop but the cemetery staff could not find his burial record. There is no record for him on FindaGrave.com either. Some clues lead to more questions: why was Price Watson transported from New Orleans to the Houston area for burial? He did have family in the Houston area but none of them are buried in this cemetery. All of these clues from the death certificate provide useful information about the circumstances of the death and burial of Price Bishop. 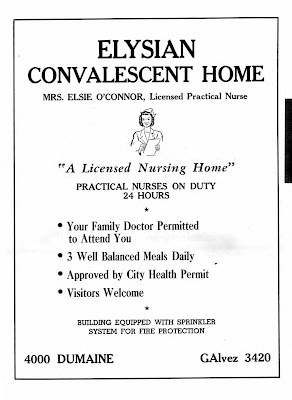 The advertisement from the City Directory gives some reassurance that Mr. Bishop received good care. Hopefully, the cemetery will be able to find precisely where he is buried. More mysteries need to be solved as to why and where he was buried in Grand View Memorial Park. If you would like to learn more about genealogical research techniques, please contact me.